Medrie MacPhee, In the Red, 2017, oil and clothing on canvas, 45 x 55 inches. Contributed by Sharon Butler / Medrie MacPhee’s new paintings, on view at Tibor de Nagy (recently relocated to shared space with Betty Cuningham on the Lower East Side) feature sewing notions and fabric pieces—zippers, pockets, buttons, facings, sleeves, and so forth—all harvested from cheap, disassembled clothing. 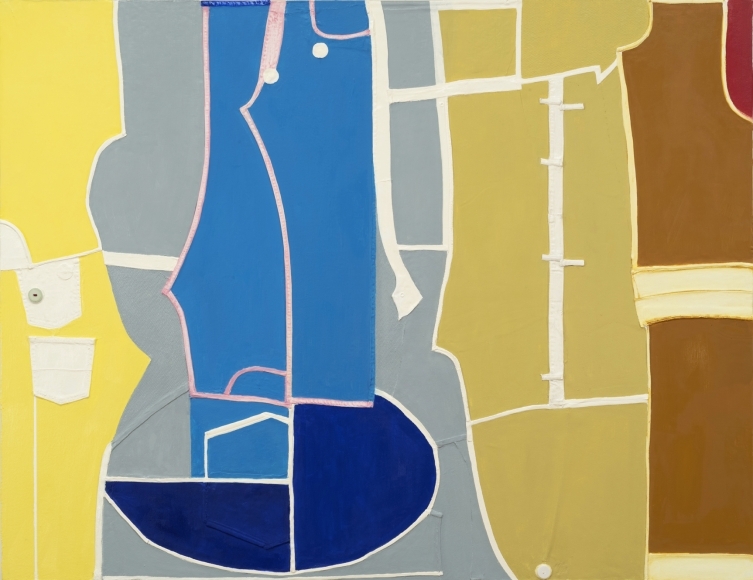 The elements and shapes are flattened out, pasted onto the two-dimensional surface, and painted with a odd color palette. The effect, devoid of any fashionable digital reference or nod to our collective distraction, conjures the decisive presence and independent object-hood of abstract paintings from an earlier era. Medrie MacPhee, A Dream of Peace, 2017, oil and mixed media on canvas, 60 x 78 inches. Medrie MacPhee, Left Unsaid, 2017, oil and clothing on wood, 40 x 30 inches. This new body of work, inventive and considered, is a departure for MacPhee. Last year during a visit to her Ridgewood studio, I saw some older paintings and works on paper. The images had a dystopic vibe, depicting fragments of architecture and deflated, almost comical, non-referential blob-like shapes. 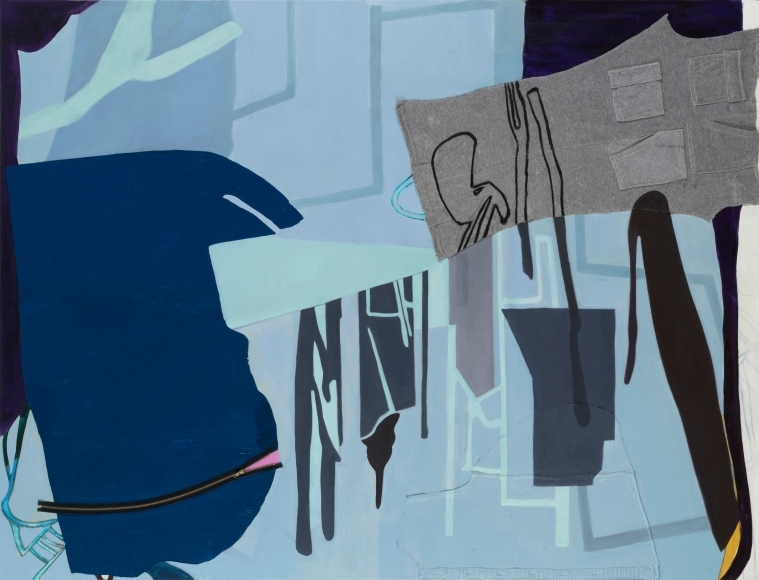 At the time, the painting titled Big Blue was still a work in progress, and MacPhee had pasted some old sweat pants and a zipper onto the painted image. She had them lying around from a previous, unrelated project: upcycling cheap clothes into jumpsuits to give as amusing gifts for friends. The addition of the clothing parts was an interesting new development on the canvas, but MacPhee was still unsure whether it worked. 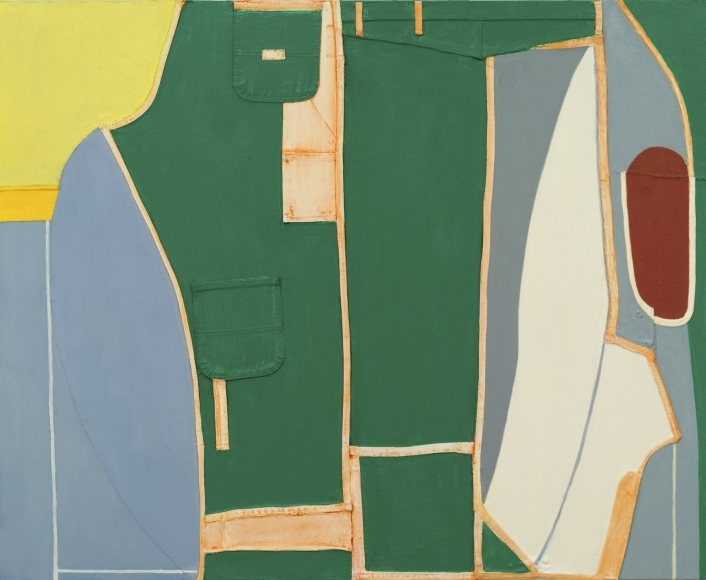 Now, a year later, she has made up her mind: the new paintings are chock full of thick, solid-colored fabric pieces, fabric trim, and other unhinged clothing parts. They work. 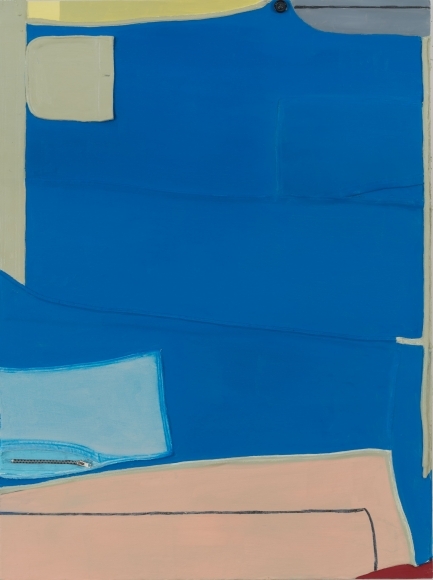 Medrie MacPhee, Big Blue, 2016, oil and collaged materials on canvas, 84 x 64 inches. Medrie MacPhee, Are We Green About This?, 2017, oil and mixed media on canvas, 45 x 55 inches. 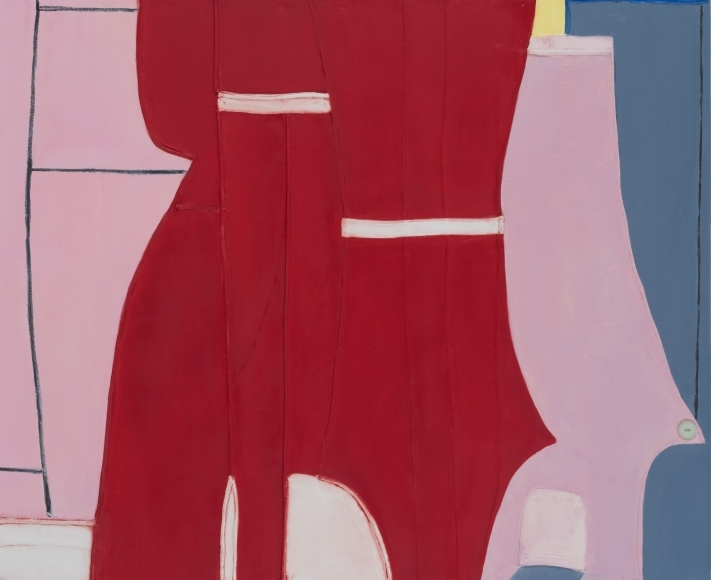 At first glance, the paintings seem like formal abstraction, investigations of relationships between shape and line, but, when seen in terms of the development of MacPhee’s visual language, they are more complex than simple arrangements of form. 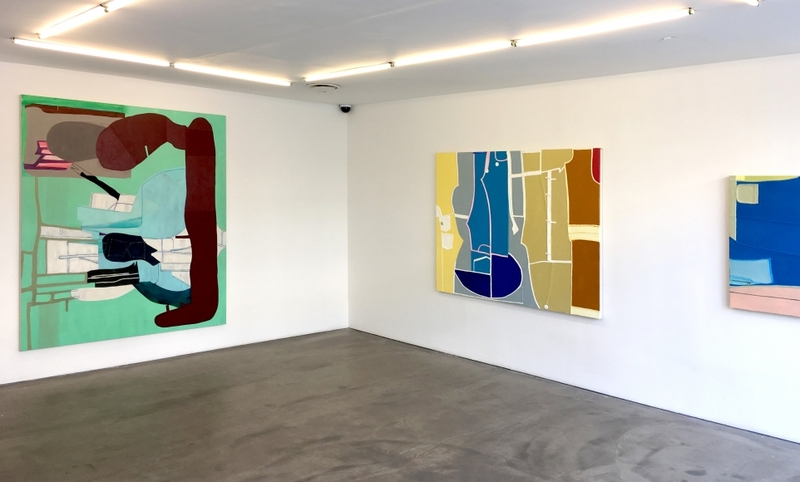 MacPhee seems—consciously or unconsciously–to make aesthetic choices that telegraph collective despair at the instability and danger we are experiencing from our current political situation. She creates the abstract images through a process of creative destruction. Items that were once fully utilitarian and three-dimensional are dismantled, their elements recombined in new formations. The space is shallow, the lines and shapes are pushed up to the surface, and a sense of claustrophobia prevails. Expressing anxiety is, paradoxically, liberating. “Medrie MacPhee: Scavenge,” Tibor de Nagy, LES, New York, NY. Through July 28, 2017.